Several human protozoan infections have recently assumed prominence in the context of severe immunosuppressive states (including the acquired immune deficiency syndrome (AIDS)), in which they occur as ‘opportunists’. Pneumocystis carinii (Blaser and Cohn 1986; Cook 1987a), Toxoplasma gondii (Navia et al. 1986; Cook 1987a), and Leishmania donovani (Badaró et al. 1986; Montalban et al. 1987) (the causative agent of visceral leishmaniasis or Kala-azar) are protozoa which can parasitize the respiratory, central nervous, and reticulo-endothelial systems respectively (Chaps. 2, 9 and 12). Gastrointestinal defence mechanisms, as well as systematic ones, are, however, compromised in AIDS sufferers (Rodgers et al. 1986; Siegal et al. 1986) and here too various protozoa (coccidia) are, as a consequence, allowed to run riot! Numerically, Cryptosporidium sp is the most important of the human coccidial infections (Whiteside et al. 1984; Casemore et al. 1985; Fayer and Ungar 1986; Cook 1987b; 1988a,b; 1990; Current 1988; Soave and Johnson 1988; Tzipori 1988; Casemore 1989). This organism was first demonstrated by Tyzzer in 1907 to parasitize the stomach and small-intestine of mice (Casemore et al. 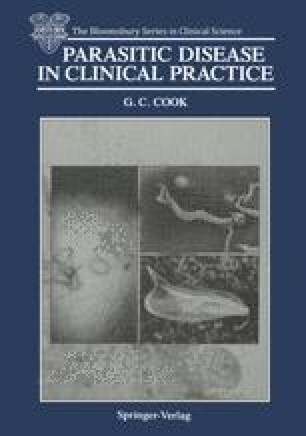 1985; Fayer and Ungar 1986); its causative role in diarrhoea in turkeys and calves was elucidated in 1955 and 1971 respectively (Cook 1990). Isospora belli (Whiteside et al. 1984; Forthal and Guest 1984; DeHovitz et al. 1986; Gelb and Miller 1986; Cook 1987b; Soave and Johnson 1988) and Sarcocystis hominis (Greve 1985; Cook 1987a; Dubey et al. 1989) are also important in the immunosuppressed. In the last stages of this illness a diarrhoea helps to waste the little remainder of flesh and strength.